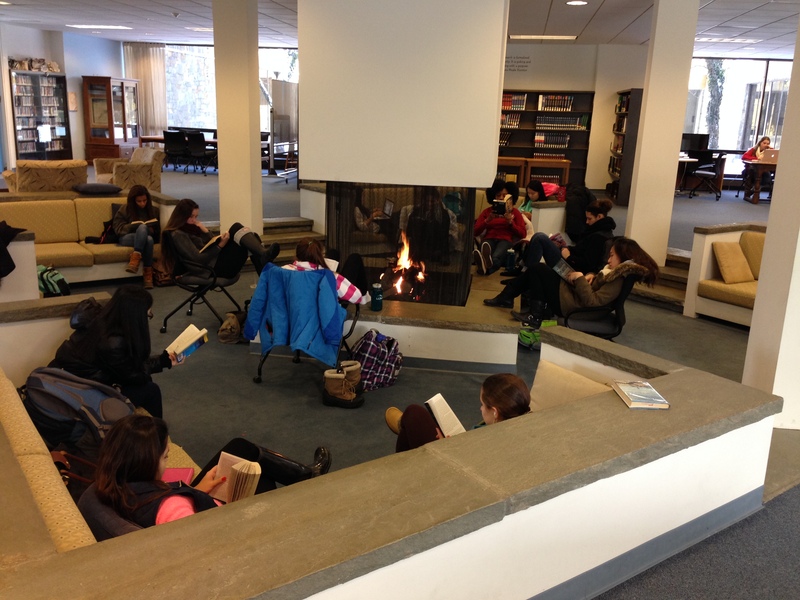 In years past, I have prepared for the upcoming winter break by creating my own “Eighth Wonder of the World”, aka ” The Great Wall Of Break Reads”, by lining the wall around the fireplace pit in the center of my library with good books. The rest of the collection is upstairs in tall stacks so there isn’t a ton of room for book displays. It works in that it puts the book covers in girls’ faces. They see the glossy print books and are reminded that they will soon have ample time in which to veg out and read. It’s good! English teachers have brought their classes in to “shop”, have asked me to book talk the wall, and it’s given me the chance to promote Overdrive, too, if there’s a lot of competition over individual titles. Downside: it only reaches those who enter the library. While I would like to claim that 100% of our students spend their days in our space, it’s simply not so. Other downside: I’m still up to my neck in shelving after this year’s “Researchmageddon”. Anyone who says the print book is dead should come visit after the final drafts of fall research papers are turned in. I’m being conservative in how many more books I pull. I think it’s called “Shelving PTSD”. It’s a thing, I promise. So where can we go to reach 100% of them, to increase our odds of checkout and decrease the things we take back and shelve? We head to the dining hall, that’s where! The day before Thanksgiving break, my assistant and I carted over armloads of books that we were prepared to talk, new and classic alike, and set them up on a table outside the dining hall, where every student would pass. We brought two laptops with barcode scanners and made a quick banner out of butcher paper that read “POP UP LIBRARY! Get your break reading here!!”. There was a line, friends, a line! We checked books out to students and adults alike. We talked books with girls we had never talked books with before. We learned about their lives, we learned about some big time competition we didn’t even realize was competition…fan fiction. [More on this in a future blog post. Stay tuned.] We invited them to write reviews for our library blog when we returned from break. When all was said and done, we checked out all but a few of the books we had taken over and had very little to carry back. I only found one book in lost and found later. 🙂 All in all, I’d call it a success! I’m thinking of moving the pop up library around campus and making it into a hashtag game, sort of like the food truck phenomenon. We’ll definitely do it again Thursday and Friday this week, but we’re open to other ideas too! What do you do to promote break reading at your school? Also, if you haven’t already read “I’ll Give You the Sun”, stop what you’re doing and grab it for your own break reading. Best YA book I’ve read in a long time. Wishing you all a restorative winter break and a happy, healthy 2016! This entry was posted in Uncategorized and tagged circulation, Display, reading by Katie Archambault. Bookmark the permalink. So exciting, Katie! I love the Pop-Up Library idea, and vow to try it here next semester. We’re going to by copycats for Spring Break reading!